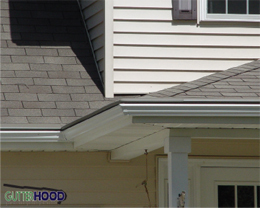 FAST FREE ESTIMATES + HOMEOWNER DISCOUNTS FOR QUALITY GUTTERS AND COVERS! 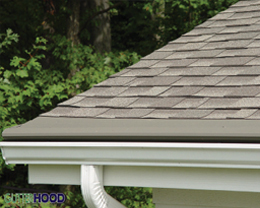 Weather protection, security and lasting beauty – you get it all when you call Gutter Shield, LLC. For affordable rain gutters, energy-efficient windows and durable vinyl siding, we are the name to remember! Call now for a free, no obligation estimate. 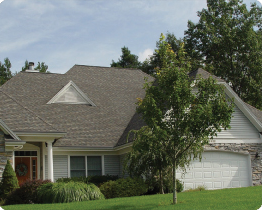 Your house needs year-round protection from wind, rain, hail and snow. Our top quality products are installed to manufacturer specifications and come with our exclusive labor guarantee. You – and your precious home – are protected. From order to installation, we are much faster and more affordable than the competition, so you can enjoy your beautified home sooner. As members of the BBB and Angie’s List, you can feel secure knowing you have the most experienced and reliable crews on the job – many of our full-time staff are former business owners. 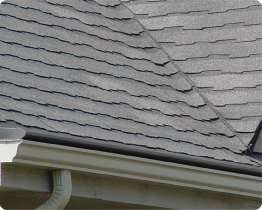 Rain and melting snow need help getting off your roof. Our drainage systems are what you need. 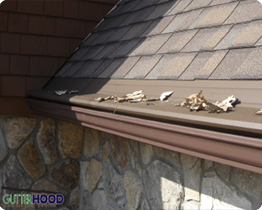 Get rid of sagging, rusted gutters and let us provide high efficiency replacements now. We have sets for every budget, every grade of vinyl, aluminum, steel and copper. 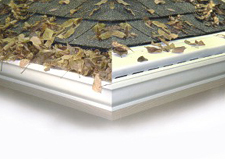 After we install gutters in Birmingham, we recommend giving them the lasting protection of a Gutter Hood leaf guard. It’s been proven on more than 1 million homes for 25 years! 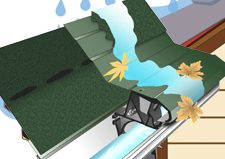 Both thicker and less costly than the competition, these closed-top gutter guards eliminate gutter cleaning. The only guaranteed “nose-forward” gutter screen in the business. They channel 22 inches of rain per hour and stop debris from getting in. 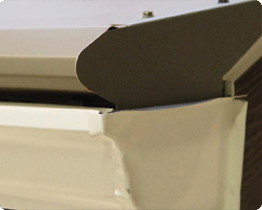 Coated with Kynar 500, the same high-tech coating used on UPS trucks and John Deere vehicles. Sturdy brackets screw securely to your fascia – no added weight or risky holes in the roof. The ribbed design slows and spreads water, causing it to sheet instead of bead. 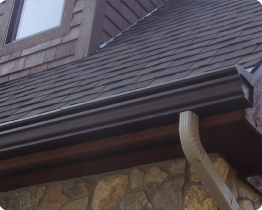 Our gutters cost less than you think. Call now for a free quote. Not ready for a new set? No problem! Call us for fast and dependable repairs. We can replace loose brackets, patch holes and secure downspouts. If yours were never angled properly or have started to sag, we can correct it in a very short time. We install all styles of frames, panes and coatings. Window replacement adds beauty inside and out. And it is a great energy-saving strategy: about 25 percent of your heated and cooled air literally goes “out the window.” Your A/C runs harder, too. If you want to renew the beauty of your homes' exterior, vinyl siding offers the best of all worlds: hundreds of color choices and wood-like finishes that do not fade or chip, and superior weather resistance. Many styles are affordable and great insulators, helping to keep your power bills in check. Vinyl siding maintenance is extremely easy: Because there’s no painting involved, there is no need to sand, prime or recoat. Insects and rot are never a problem, either, and maintenance is as simple as soap and water – that’s it! Our vinyl siding prices will satisfy your budget too. There is a style, gauge and texture for just about every need. 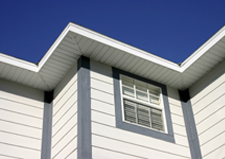 Because vinyl siding is easy to install, it keeps installation costs reasonable. Repairs are extremely simple for a professional. If they are ever dented in a catastrophic storm, we can change out panels in minutes. You will never know the difference because color matching is our specialty. Your 100 percent satisfaction is paramount to us. You will get all estimates in writing – and the amounts won’t change. All our work comes with our labor guarantee for technical excellence and top quality workmanship that you can afford. We will begin and end our work when we promise, and treat your home like we would our own. Our cleanup will leave you as satisfied as the work itself. We are state licensed, insured and experienced. Surround your home with the tough protection you need. It’s the best investment you will make to keep your house and family safe all year long. 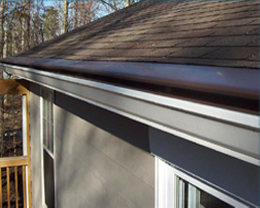 We offer windows, vinyl siding and rain gutter services in Birmingham, Mountain Brook, Vestavia, Hoover, AL.